Growing up in 1950’s America, I believed all the stories about the American Dream, American Benevolence, Prosperity via Capitalism, and Bringing Democracy to the Free World. That all sounds so quaint now, after Vietnam, 9/11, Guantanamo, torture, targeted killings, economic collapse, and all the rest. Nonetheless, it took me many years to unravel all the old stories, about how the world works, and to begin piecing together stories that match the facts and make sense. In 1994 I moved to Ireland in order to devote my full attention to learning how deep the rabbit hole goes. All my assumptions about history, politics, and economics, came under examination. I approached this as a scientific endeavor – generating hypotheses (stories) about how things really work, and then testing those hypotheses via further research. As my research proceeded, I began posting my ideas to the cyberjournal blog (see sidebar). Comments and feedback from a growing list of subscribers became, and remains, one of my richest sources of learning. Of course I learned much from other investigators and analysts, but nothing was taken on faith – I chose only to believe what I could understand from first principles. What became clear is that the whole mainstream narrative about public affairs and history – what we are taught in schools and what we see on television – is a fabricated illusion, a bundle of myths that I refer to as the ‘matrix world’. If you click on The real world & the Matrix world (sidebar), you’ll find a still-growing collection of articles, telling the real story of how we got into this mess, what’s happening now, and where humanity seems to be headed. Every culture throughout history has had its own stories, partly true and partly myth, which define reality for each society. In pre-civilized societies these stories emerged organically, out of the experience of the tribe. In civilized societies, we see the emergence of fabricated stories, designed for the purpose of controlling populations. 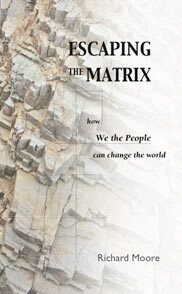 Today’s complex matrix world is based on highly evolved psychological principles. If you click on Mythology & mind control, you’ll find my ‘stories of the story’ – the evolution of modern mythology, and how scientific techniques control how people perceive the world around them. With a background in math, physics, and systems, I’ve been exploring over the past few years some of the amazing breakthroughs that have been happening in science, usually by groups of independent researchers who are being ignored by mainstream scientists. It turns out that science in general is currently in a state of crisis. If you want to dive into this rabbit hole, click on Science in crisis.